being MVP: Easing the Cough with LilaPops & One for You! Easing the Cough with LilaPops & One for You! Kenzie had this odd random cough from deep within her chest. I really didn't know how to ease it other than giving her some juice/water and patting her on the back. I was so happy to discover Lilapops which are all natural cough drop lollipops! 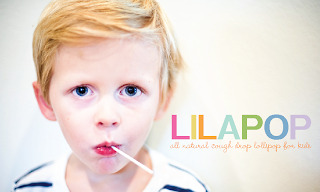 Lilapops are made of the following short list of pronounceable ingredients: Honey, Marshmallow Root Extract, Sugar, Corn Syrup, Natural Flavors, Water. I love that they do not include artificial flavors, preservatives or dyes. Kenzie does not get candy (unless grandma gives her some during the day). Kenzie saw the Lilapops and immediately wanted a "lollipop" (she knows what lollipops are because Hubs eats them all the time). Although these pops are not recommended for children under the age of 3, with supervision Kenzie was fine. The smiling just wouldn't stop as she was sucking away. The flavor is called "grapeberry" and the flavor is very light without being too sugary. I am glad to have a "remedy" for Kenzie's coughing in a form that she loves and I find safe. I personally think she would take one everyday if I let her (I had to hide them on the top shelf). Kenzie is a happy and satisfied tot with a cough that is soothed. One Winner will Receive a 3-pack of Lilapops (ARV $19.99)! yes, the contest is open to canadians! I need these because my kids are under the age for cough medicine and I feel so helpless when they can't stop coughing! I would love these for my son and daughter! They don't get candy very often, but would love this alternative with less crap in it! These would be great for my mum. She hates cough syrup and loves lollipops. They be neat for my nephews toddler s well. Getting him to take any medicine is a struggle. Follow you as "From Furrin" on GFC. I need these because Mackenzie has been having some cough issues and I hate having to give her the meds from the store! My daughter has had a cough so much this year so these would come in handy.